After a busy four days, the CP+ 2016 camera expo has closed its doors. For Pentax fans, this show was arguably one of the most significant events of the decade. Ricoh Imaging finally released the Pentax K-1 full-frame DSLR, a long-awaited camera that was the subject of wild speculation and some very emotional discussions on our forum. Unsurprisingly, Ricoh made this camera the star of their exhibit; it even went as far as completely omitting displays for other K-mount bodies, the 645 digital system, and the ultra-compact Q-mount system. The Ricoh booth did feature Pentax sport optics, the Theta 360, and the outdoor WG series, however. 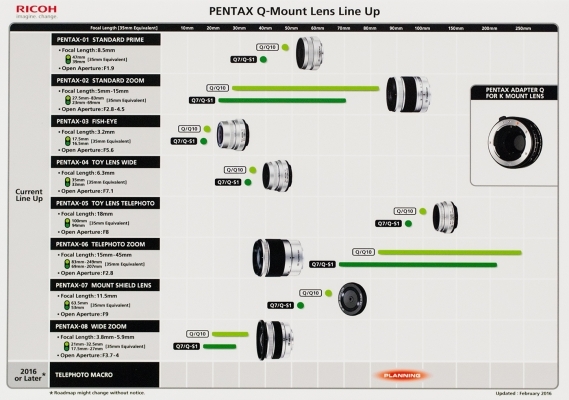 Five new D FA lenses are planned for release in "2017 or later"
An APS-C wide-angle zoom and a Q-mount telephoto macro lens remain roadmapped for "2016 or later"
Most importantly, though, the launch of the Pentax K-1 will put an end to the countless speculative threads and thus allow many Pentaxians to go back to what matters most: taking pictures! It will be interesting to see how the K-1 is received by the larger photographic community once it starts shipping and getting reviewed. The fact that Pentax is now one of only three manufacturers offering a full-frame DSLR should inherently continue generating a good deal of long-term buzz. A video tour of the Ricoh Imaging booth follows. We are currently the process of reviewing a production model of the Theta S. Our initial impressions are positive; beyond its improved image quality, the Theta S is also much easier to hold thanks to a marginally larger body and a rubber-like exterior lining that prevents the camera from slipping out of your grasp. Learn more about about what the Theta can do in our full Theta m15 review. The Ricoh Imaging booth at CP+ 2016 placed a heavy emphasis on the recently-launched Pentax K-1. Today we take an even closer look at what's on the inside of the Pentax's first full frame DSLR. Most of the technology inside the K-1 was either developed from scratch or updated specifically for this new body. A special display case on the show floor allowed us to gain valuable insight about what's found under the hood. Perhaps one of the most exciting additions is the new five-axis Shake Reduction II (SR II) system. In addition to offering an extra stop of compensation over previous models (up to 5 stops total), SR II compensates more effectively for camera roll. Suppose that a photo would normally require a shutter sped of 1/500s to appear sharp; with Shake Reduction, it may well be sharp at 1/15s. A larger chunk of glass is needed for a full-frame optical viewfinder. The K-1's pentaprism offers nearly full coverage of the image area and the viewfinder image is almost twice as large as that of APS-C bodies (despite a lower magnification rating). The latest-generation Pentax CPU is dubbed "PRIME IV". It enables the largest-ever continuous shooting buffer in a Pentax DSLR. 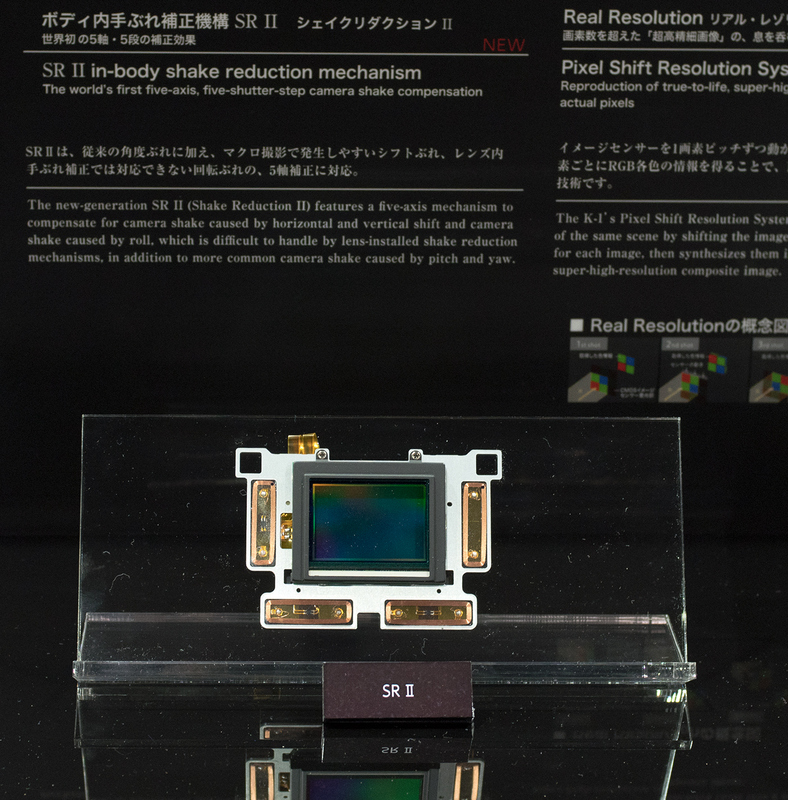 At the heart of the K-1 lies a "newly developed" 36.4-megapixel CMOS sensor. Community sources suggest that the chip is manufactured by Sony. The sensor supports an ISO range of 100 to 204,800 (the highest in its class). Expect the K-1 to be able to take a beating thanks to a magnesium alloy body, metal chassis, and weather-sealed construction. The camera's rear LCD hinges are just as tough as the body itself. These hinges have been designed to support the entire weight of the camera plus a reasonably-sized lens. Of course, this isn't a typical use case, but the flexibility for a user to quickly grab the camera by the LCD could for instance save the camera from an unfortunate drop while in the field. The shutter mechanism is another piece of hardware that must be re-worked for a larger image format. Furthermore, the K-1 allows for flash synchronization up to 1/200s, an improvement over the previous limit of 1/180s. All this shows that a considerable effort was put in to the K-1's development. It's now evident why Pentax couldn't "just release" a full-frame two or three years ago. Even today, users will get a lot of technology for the K-1's comparatively low launch price of $1799 (USD). At this year's CP+ show, Ricoh Imaging representatives once again took a moment to sit down with us and answer a number of community questions about the Pentax K-1 and related topics. Unfortunately, due to disruptive audio tests at the nearby Nikon booth, our on-camera time was cut short. The remainder of the interview follows the video in paraphrased text form. 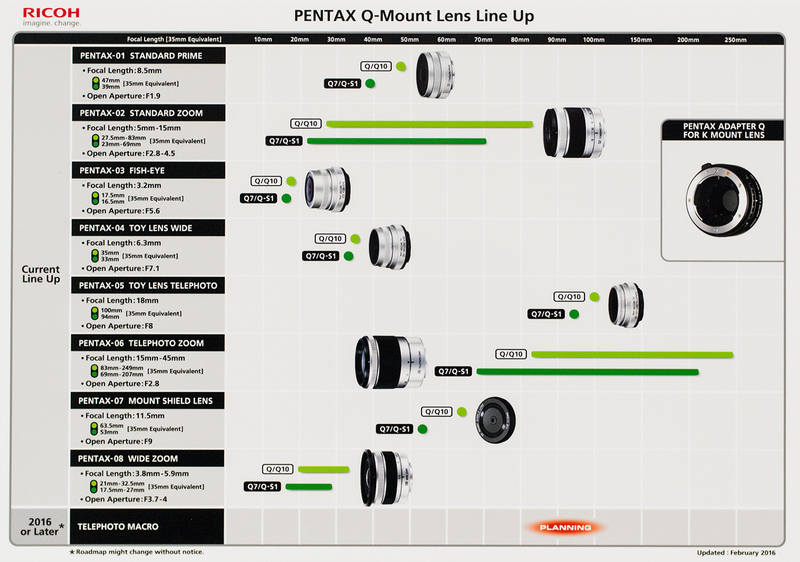 Do you have any updates for Pentax Q users? The Q line is still a current line, but we focused our limited resources on the K-1. We plan to release the roadmapped Q-mount macro lens in the near future. Have you done anything to compel third-party manufacturers to expand their K-mount lineups? How does the K-1's video mode compare to that of the K-3? First-hand coverage of the 2016 CP+ camera trade show in Tokyo, plus an exclusive interview with Ricoh Imaging. Did you get hold of one of those K-1 brochures - and has it got anything unexpected in it?